I previously published a list of commanders of the 384th Bomb Group and it seems that I left one out. At the end of the war in Europe, the 384th Bomb Group moved from Grafton Underwood, England to Istres, France in June 1945. Lt. Col. Robert W. Fish took command on June 17, 1945 and stayed in that position until October 18, 1945, just a day over four months. Lt. Col. Fish is the last commander of the 384th I listed. But the story of the 384th in Istres actually continues into 1946. On October 18, 1945, Lt. Col. Lloyd D. Chapman took command and led the group until the 384th Bomb Group was inactivated on February 28, 1946. Lloyd Douglas Chapman was born on April 21, 1919 in Walters, Oklahoma. He enlisted in the Army Air Corps on September 11, 1940. His enlistment record shows that his term of enlistment was for the Philippine Department. It also shows he had four years of high school and his civilian occupation was in building aircraft. Lloyd was single at the time he enlisted, but on June 6, 1941, he married Vivian Jernigan of Sand Springs, Oklahoma. Though Chapman had only a four plus-month stint with the 384th, he had a long career of service to his country. During WWII, he was both a B-17 (his personal favorite aircraft) and B-24 bomber pilot and flew missions over Europe from both England and Africa. In 1951 he flew in combat again, leading the first B-29 Bomb Squadron over Korea. Later in his career he went on to fly the B-36 Heavy bomber, B-47 Medium bomber, B-52 Heavy bomber, B-58 Hustler bomber, KC 135 Strato tanker, and the T39 six passenger executive jet. In his thirty years of honorable service with the US Air Force, Chapman made seventeen permanent changes of station. Some of the positions he held were Instructor Pilot, Director of Operations 303rd Bomb Wing (Medium), Director of Operations Strategic Air Command, Chief of Staff 2nd Air Force, member of the National Security Council where he briefed President Eisenhower on security issues, and the Air Attache to Oslo, Norway. 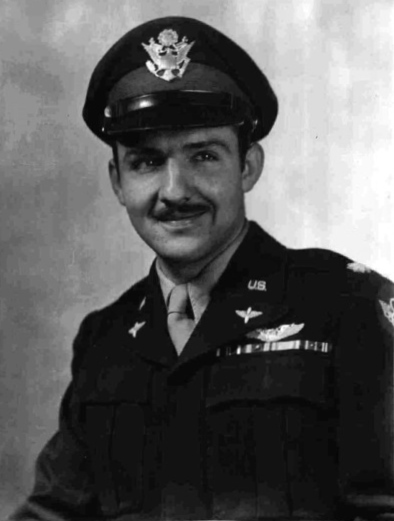 Col. Chapman was highly awarded, receiving the following decorations during his Air Force career: Legion of Merit – one oak leaf cluster, Distinguished Flying Cross – 17 oak leaf clusters, Bronze Star – two oak leaf clusters, Air Medal – three oak leaf clusters, American Defense Service Medal – two oak leaf clusters, American Campaign Medal-Europe, African Middle Eastern Campaign Medal – five oak leaf clusters, World War II Victory Medal, Army Occupation Medal, National Defense Service Medal, Korean Service Medal, United Nations Service Medal, Command Pilot Wings and the National Security Council badge. After he retired from the Air Force, Northrop Aircraft hired him as the director of the Scandinavian Division where he worked for ten years in Oslo, Norway. While in Oslo he was also the President of the American Lutheran Church Council and consulted for the American Businessman’s Club of the World. Once he retired from Northrop Aircraft, he moved to Honolulu, Hawaii where he and his wife Vivian lived for 14 years. In Honolulu, he was President of the Prince of Peace Lutheran Church Council. He also advised islanders how to start their own businesses, again through the American Businessman’s Club. He also worked with AFTA helping the islanders with insurance claims, grants, and loans for repairs after hurricanes. He later suffered from Alzheimer’s disease and he and Vivian moved back to the mainland so they could be closer to family in Scottsdale, Arizona. After a five year battle, he succumbed to the disease. Chapman died December 9, 2004 in Scottsdale, Airzona. Note: Information on Chapman was found on Legacy.com from Chapman’s obituary published in The Arizona Republic on December 12, 2004. His service with the 384th Bomb Group is listed here. By thearrowheadclub in 384th Bomb Group, Commanding Officers on October 12, 2016 .